American beech (Fagus grandifolia) trees are dominant in Rockefeller State Park Preserve and are one of the last trees to lose their foliage in the fall. This image is a blended composite of one regular image with a vertically motion blurred image (on tripod). I used the gradient tool on a layer mask in Photoshop to accomplish the blend. The image transitions fully to the motion blurred image about halfway up the frame. Canon 7D, Sigma 70-300mm f/4-5.6, ISO 100, f/16, 0.4 seconds. 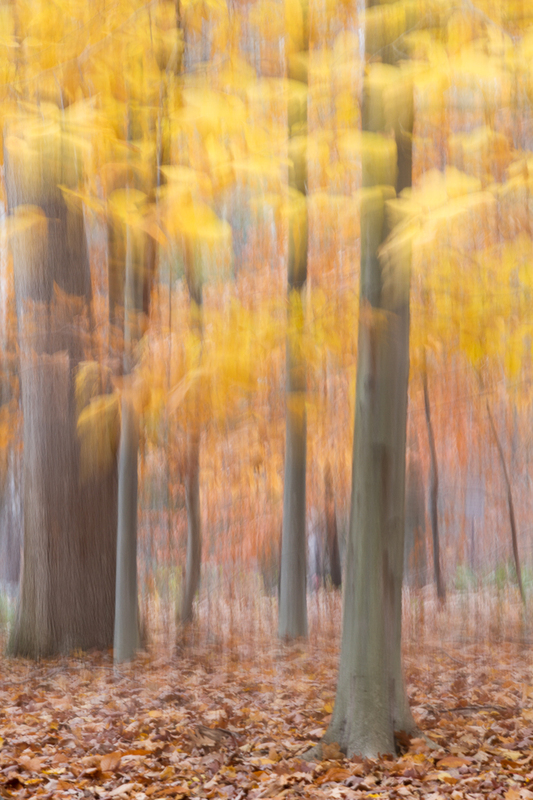 As promised, here is my second installation of Late Fall Abstracts from around Rockefeller State Park Preserve and adjacent land. Also as promised, I'll describe a little bit of the process for making these abstract images. I'll provide some general tips, but really making abstracts with a digital camera is an excuse to have some fun and get out there and experiment; really exercise your creativity. A loose up and down movement with a 70-300mm lens set at 190mm (x1.6) and settings of f/22 for 0.4 secs at ISO 100 gives a nice vertical blur with just a touch of wobble, but the mostly vertical tree trunks still look like tree trunks. With a telephoto at this shutter speed and an medium speed tripod pan, you get a more impressionistic effect, but just enough detail to keep the scene recognizable. As I said above, making abstracts is really a time to experiment, but there are some basic motions to keep in mind to get you started. The most basic are vertical pans and horizontal pans. These work really well when you have strong vertical or horizontal lines in your composition. 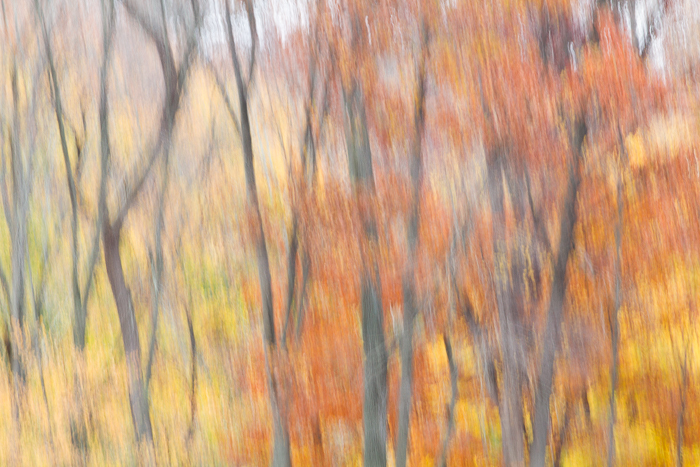 For example, tree trunks with fall foliage make great subjects for vertical panning, while an ocean composition with incoming wave lines and a strong horizon line might make a good subject for horizontal panning. Another effective technique, particularly with a telephoto lens, is to make very tight circles with your lens as you expose. This can produce some stunning results, but I find with dark tree trunks on a light contrasting background you tend to get a halo effect along the edge of the trunk that I'm personally not a fan of. A more advanced move is to try to rotate the camera around a node, either the focal plane of the lens, or the subject itself which can render some objects almost sharp while strongly blurring others. Or try moving back and forth, rather than in just one direction. You can also rotate your camera around the axis of the lens, creating circles or spirals with objects in the center being most clear. 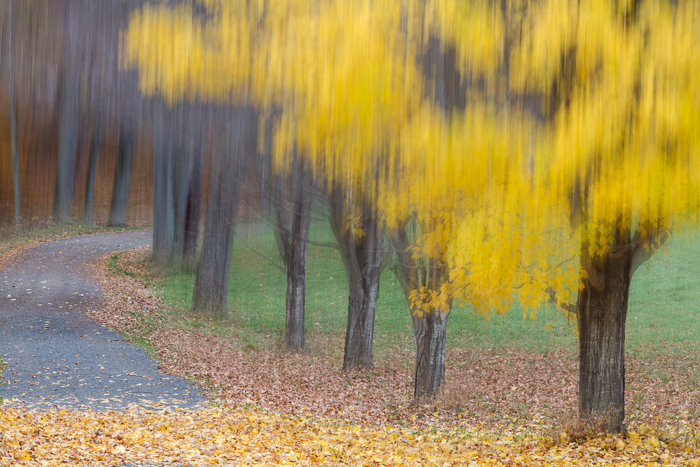 Zoom blurs can be appropriate for the right subject, but are often overdone or cliche. If you are a passenger in a car, you can also use your own movement to create the blur. If your goal is to create a smooth blur, make sure to follow through well after you hear the shutter click closed. As for support, it depends on what you want to accomplish. If your goal is to capture, somewhat realistically, those strong vertical or horizontal lines in your composition, then panning on a tripod might be your best option. Handheld is often easier and gives you more range of motion. Plus the inevitable camera shake can give even a straightforward vertical or horizontal pan some interesting cross-hatching or feathering that can be quite appealing in a more impressionistic composition. Another straight vertical pan of mostly American Beech trees with some oak trunks. Canon 7D, Sigma 70-300mm f/4-5.6 (at 70mm), ISO 100, f/16, 0.6 sec. You can make motion blur with any lens, but the effect the required amount of motion depend on the type of lens. With a telephoto lens you get a magnification of the motion, so you need less motion and/or shorter shutter speeds to get a good blur. With wide-angle lenses, you will need comparatively more motion and/or longer shutter speeds to get the same or similar blur effect. However, wide-angle lenses also mean less magnification of unintentional camera shake. Your shutter speed really depends on how much blur you are hoping to get, how fast you move the camera, and what focal length lens you are using. Slower movement and/or wide-angle lenses require longer shutter speeds; faster movement and/or longer focal lengths means you will use shorter shutter speeds. As a starting point, use a shutter speed between 1/4 to 1/2 of a second. If the blur is too much, increase the shutter speed or move the camera slower. If the blur is not enough, then do the opposite, use a longer shutter speed or move the camera faster. Obviously when using shutter speeds this slow, you'll need to have a low ISO (on most digital models these days that is ISO 100) and possibly be shooting in the shade or on a cloudy or rainy day (perfect days for fall color). If you must shoot under bright conditions, then you will likely need to use ND filters to get your shutter speed down. 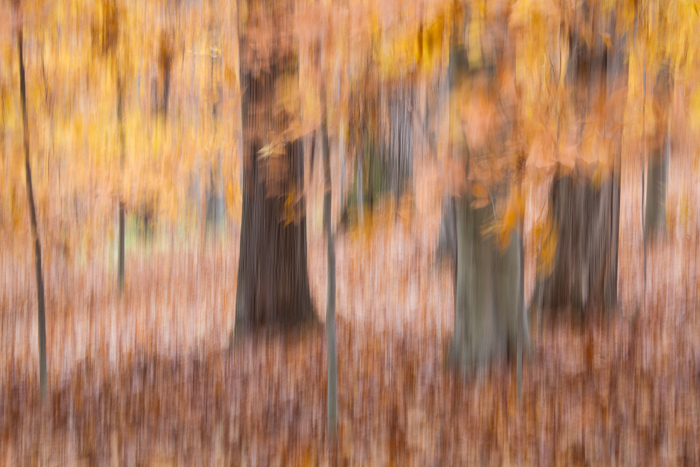 At least for shooting fall color abstracts, I also recommend exposing about a stop higher than you would expose that same scene normally. It is very easy for blurs to become very muddy, so opening up a stop helps lighten things up and adds to the ethereal quality. As long as you don't overexpose, you can always darken back down in post if you decide it is warranted. Obviously, as you take all these different factors into account, you also have to judge your framing and what you include in the composition. For example, if you don't want to pan so high as to include a bright sky, you might have to adjust your shutter speed and movement accordingly to get the amount of blur you want, but ensure the shutter is closed before the camera passes over the region of blue sky. In this image, I used the gradient tool to mask in the blurred image onto the normal still image. Then I used a soft-edged brush to paint white along the road, to keep the sharp still image showing in those areas. In the first and last photograph in this post, I combined both blurred and non-blurred images in Photoshop. First you have to take both blurred and non-blurred images with roughly the same framing in the field. This is a situation where a tripod really helps! If the alignment is slightly off, you can move the layers to match while in Photoshop and crop the areas of non-overlap. Once you have the two images loaded as layers in Photoshop and aligned, add a layer mask to the top image. The layer mask will be white to start, fully revealing the top layer and thus the bottom layer is obscured. When you paint in with black on the layer mask, it will reveal the layer below in those areas. But make sure you use the gradient tool or a very soft-edged brush, or the transition will be too harsh (unless you have a hard line in your composition where the abrupt transition would make sense). If you mess up badly, just delete the layer mask and start over with a new one. Remember that the gradient tool can be used at an angle, and it doesn't need to be pulled from one end of the photograph to the other. Shorter strokes can produce shorter areas of transition with more of the resultant photograph being completely one image or the other. Most importantly; have fun, experiment a lot, and don't be disappointed with your many failures (just learn from them if you can)!